Winter Marketing: Have You Turned Up the Heat Yet? As you get closer to winter and the weather turns cooler and then downright cold – what do you do? In my first year of college I took a test and they told me: “Mike, you are an idealist.” I said: “No, that is not right. I am a realist– I expect things to go right when I do it.” In other words, I expect to have enough business to survive the winter profitably. 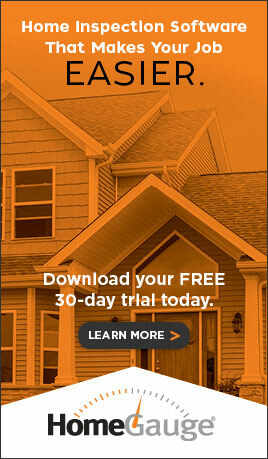 As your home starts to get colder, what do you do? I bet you walk over to the thermostat and turn on the heat, and the colder it gets, the more heat you want or the longer you want your heater to run. Or even better, the heating system adjusts for you to keep your home the same temperature, no matter how cold it is out there. You like having your home at a nice comfortable temperature—right? So, apply this thought process to your business – how are you going to turn up the heat to keep the right amount of business coming in? Here are six responses to winter that can help your business. You have to make sure you pay close attention to every single lead opportunity you get. One of the things that we do is track the response from all our marketing and advertising as much as we possibly can. If we can’t see that it is really doing anything, we might drop that marketing, especially during the wintertime. One of the things you need to create are KPIs or key performance indicators. And once you have those key performance indicators up and running, you can determine whether things are working or not so much. Every night for instance, I know how many calls we took at the office and I know how many of those we scheduled. Also, you must hone your sales process at the initial point of contact. And you actually have two initial points of contact. One is when you are walking in and out of the real estate offices trying to make sure they are willing to recommend and refer you to other people. The second initial sales process or initial point of contact is when you get the phone call. The question is how good are you at answering the phone? 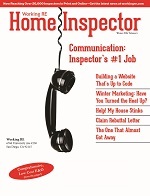 The first thing you must do is Answer the Phone and then you must get the inspection scheduled. For starters, AATP—Always Answer the Phone! If you don’t answer the phone they are calling the next person on the list. Then when you do have them on the call, you must make sure you are making the best of that opportunity to get them to say yes on that call. Ask yourself: what are you doing to get more folks to say yes, and even say yes to additional services? Here is some good news for you about your competition and mine: most of the competition will stop their marketing, or significantly slow down their marketing, as we go into wintertime. This means the phone rings less. Of course they think it is because of winter. And I think that is just brilliant on their part. Because here is number two. I call this going to the amusement park when there is a chance of rain. I love amusement parks. I love taking my grandkids to amusement parks. I have season passes at Six Flags here locally and then every five years we get annual passes for Walt Disney World. When we go and there is a chance of rain we know it is going to be a great day at the park because most people will not go when there is a chance of rain. The same is true with most of your competitors during winter. They will abandon their marketing during the wintertime. They will either slow down or they will stop marketing all together. And they give me some of the most fabulous excuses for not marketing. “Real estate agents aren’t doing as much business this time of year” or “Not as many of the agents are in the offices during November and December.” Both of these are true statements which they used as an excuse to say, “I don’t really think it is a good idea for me to be in the office and marketing as much during the wintertime.” I love my competition! Here is the thing: you actually need to be in real estate offices almost twice as often during the wintertime. If there are fewer people, if there are fewer jobs available out there, then you need to be working harder. When business is slower than normal we actually need to turn up our marketing, just like you turn up the heat when gets colder. One of the things I tell people is to create a marketing team. Talk to other companies that market to the same folks you do, whether it is real estate agents, mortgage or title companies, real estate attorneys, moving companies or insurance agencies. Join forces to market together toward your common client and make it a win/win situation. A lot of times we will team up with a mortgage, title or even a roofing company to market together. Visit TopAgentMovie.com for an example. This is really important and is different from everything I have talked about up to this point. This is one thing you cannot do: you cannot sing the winter blues. You can’t go out and say: “Wow, guys you know, man, business sure has slacked off.” You can’t do it with the real estate agents or the mortgage or title company. You can’t do it with anybody. 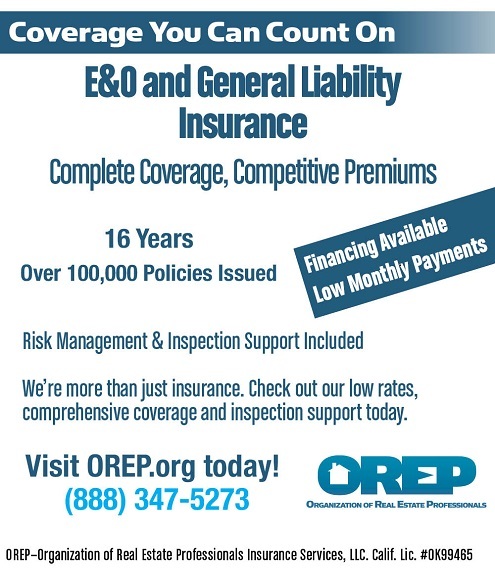 Winter response #5 Look at what revenue streams you are missing or that you are not taking advantage of right now. 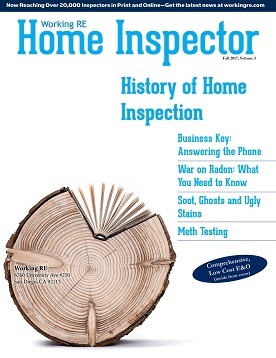 Now is a great time to add radon inspections or maybe even mold inspections or some other service that you haven’t done before. At least use this time to get the proper training to do these and other types of inspections once the regular season is back. Look at what revenue streams you are missing or that you are not taking advantage of right now. 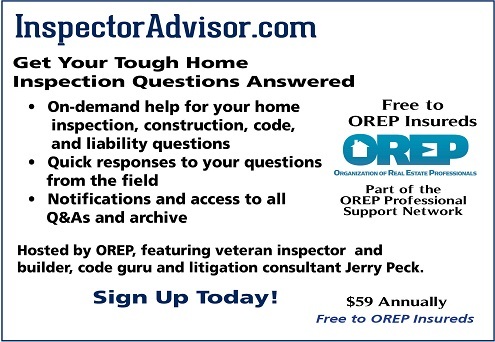 Now is a great time to add radon inspections or maybe even mold inspections or some other service that you haven’t done before. At least use this time to get the proper training to do these and other types of inspections once the regular season is back. Also, look around. What other type of work is available in your industry that your competition is ignoring? Here are a couple of unusual examples. One of the things that people often ignore is winterizing and dewinterizing. Now, I will tell you that I don’t really want to do these. However, I don’t want them to stop me from getting inspections either. Plus, if I do them, there can be extra money for doing it. Some of our members of the Mastermind Inspector Community, especially in really cold areas, are doing them and they are getting paid good money— from $125 to $250 to winterize the property. Go back to your customers, or as I call them, “mavens.” Do business with old customers instead of just leaving them and going on to the next. Call all of your top agents to tell them: “thank you.” This is important. This is actually something that we emphasize, especially as November hits. Again, tell all of the agents who have been working with you “thank you” and how much you appreciate them and what a great year it’s been. You don’t ask for business. You don’t even have to ask for referrals. Just making those calls to top agents will help you get more referrals and give you an upswing in business as you go into November and December. The bottom line is to make sure that you are out there because the people who are working during winter also appreciate other people who are working during winter to run and grow their businesses. They are there working hard, and they love it when they see you working hard as well. It makes them want to work with you. So, what do we do as we get into the winter months? We do more marketing and we do it more consistently. In fact, the colder it gets, the more marketing you need to do. Your competition might be doing more marketing as well but I doubt it. Even if they are, it won’t come close to what you can do. • Plan five phone calls per day—just to say thanks for helping you have a great year. • Send cards to all the agents who sent you business this year. • Send a thank you card to all the managers who you did presentations for this year and want to do presentations for next year. • Send out calendars to all your top agents. The bottom line is that there are reasons our Mastermind Inspector Community outpaces the competition and why so many are having their best year ever, when so many other inspectors struggle. Just be careful not to fall into their trap of making excuses. When you hang around the right people you will find they are working on solutions, not excuses. Be successful and be around those who are successful too. Mike Crow is the founder of Mastermind Inspector Community and has personally performed 10,000+ inspections and built two 7-figure+ inspection businesses. 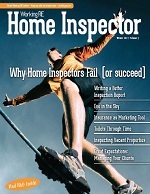 Get a FREE copy of Mike’s book “Home Inspector Marketing Secrets” at www.WREinspectors.com.